The route starts in the village of Austwick, a haven of peace just a stone’s throw from the busy A65. There is plenty of on-street parking in the village, including Townhead Lane. Follow Townhead Lane out of the village to the crossroads where the road meets the unmade Thwaite Lane. Turn left and follow the lane for a few metres then cross the wall on the right side by the stile, leading to a track across the pasture. Head for the top left corner of the field. Robin Proctor’s Scar is ahead on the left, with the waterfall of Nappa Scars to the right. Cross the wall by the throughstones stile just to the right of the locked gate. The wall curves round to the left, but a finger post guides the way straight ahead, up the hill and through the limestone outcrops. The large field ahead is a geologist’s playground, with the renowned Norber boulders everywhere about. 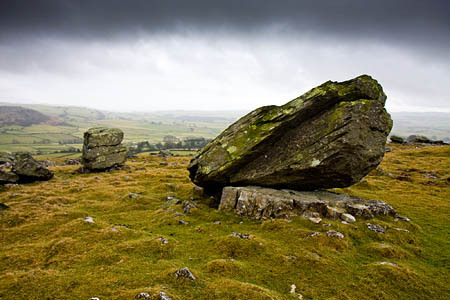 These erratics, gritstone boulders deposited on limestone by glaciers more than 10,000 years ago, now perch on smaller pedestals in many places, the less resistant limestone having been eroded more than the sandstone. After exploring some of the crazily angled stones, head for the wall corner at the northern end of the field, and use the stile to cross the wall. There are numerous feint paths mostly following a northerly direction parallel to the wall just crossed. These can be used, but it pays to clamber up the slope to top out on to the summit of Norber itself, an elongated north-south plateau with numerous cairns. The actual highest point is far from easy to determine, but is marked by a low cairn. Continue in a northerly direction along the summit plateau until the Clapham to Selside track is reached, a broad, grassy ancient route which is a continuation of the Long Lane route out of Clapham and leading to Gearstones and Hawes. The walking is pleasant on well-drained limestone pasture, but don’t get too distracted as you will need to look for a small cairn marking the departure on the left of the track to the old shooting box which lies on the path from Sulber. Turn on to this left-hand track and follow the route, which crosses a low broken wall then gets increasingly wet underfoot as the limestone is left, for 1.7km. If you miss the turn, continue along the Selside track until the ‘Sulber crossroads’ finger post is met, then turn left, following the Ingleborough direction. The main path from Horton to Ingleborough is met. Turn left on to this, passing the increasingly dilapidated old shooting hut and following the easily navigated main path to Swine Tail, where the Chapel-le-Dale path is met. Turn left and follow the rocky path steeply on to the summit plateau of Ingleborough. The summit can be confusing in poor visibility, but the summit edge on the right can be used as a handrail – don’t get blown off on to the crags of The Arks and Black Shiver! – and search out the cross shelter and trig point. An alternative descent route is the Clapham path which is followed to the bottom of Trow Gill. After the gate, take the next stile on the left, just as the main track heads round to the right, and follow the steep path to meet Long Lane. Follow Long Lane for 2.1km to its t-junction with Thwaite Lane. Turn left and follow Thwaite Lane for 1.6km then hop over the stile on the right, cutting the corner of the junction and leading to Townhead Lane and back into the village. The round-trip distance using this descent route is 17km (10½ miles).